You can have your Air Bud spawned Buddies franchise of puppies spouting slang. For my money, Walt Disney Studios Home Entertainment launched its greatest direct-to-disc spinoff creation of the last decade by going back to the company’s roots to offer us a more heartfelt understanding of the wand toting Peter Pan fairy whose pixie dust brings the company’s logo to life in this sparkling collection of Tinker Bell adventures. Boasting quality commensurate to their theatrical pictures, these three lush releases instantly draw us in from the vibrant Earth based color palette that perfectly and likewise subtly complements the studio’s subsequent DisneyNature documentary releases such as Oceans and Earth given Tinker’s seasonally set storylines to the eye-popping 3D model based CG animation used to make such tiny characters fill the screen. Moving beyond the ethereal pastels of the summer season in which it’s set by moving into stormy weather and ultimately London skies, the gorgeously detailed animation work is best appreciated in the high definition Blu-ray disc included along with a DVD in this combo pack. 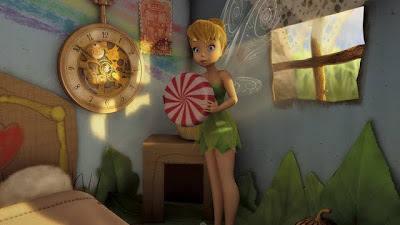 And although we leave Tinker Bell’s beloved Pixie Hollow home behind in favor of spending the summer at Fairy Camp, it’s only a matter of time before the mischievous yet loyal and brave Tink finds herself exploring completely new terrain. 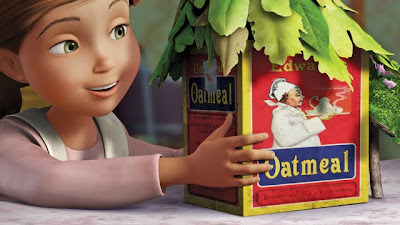 After accidentally getting trapped in a tiny playhouse designed for fairies by a lonely, imaginative young girl named Lizzie (Lauren Mote) whose scientifically fixated academic father (Michael Sheen) disapproves of her fanciful obsession, Tink (Mae Whitman) becomes the child’s much needed friend and confidante. Unable to fly with wet wings, Tinker Bell waits out the rain until it’s dry enough for her to return home to camp by teaching Lizzie everything she ever wanted to learn about life as a fairy through pantomime since although Tink understands Lizzie perfectly, the same is not true for Lizzie. 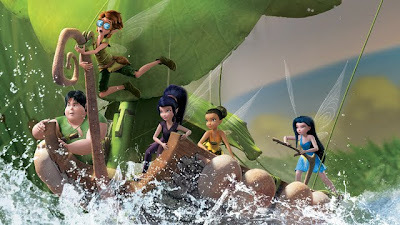 Yet unbeknown to Tink, her fairy friends have banded together to stage a daring rescue, setting off initially in a small makeshift boat before later trying to distract Lizzie’s feisty cat since they fear that Tinker Bell is being held against her will. 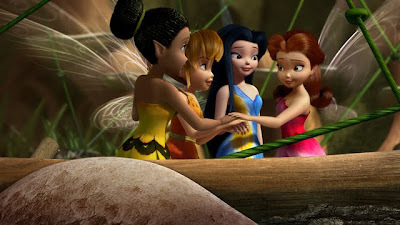 Ambitiously, Tinker Bell balances two storylines to reaffirm the importance of friendship and teamwork from both a conversational level via Lizzie and Tink’s heart-to-hearts as well as an adventurous standpoint as first the fairies track down Tink before she eventually gets in on another wondrous high-flying scheme. And with this classic quest structure in mind, Disney’s enormously entertaining third installment in the series is perhaps its strongest. 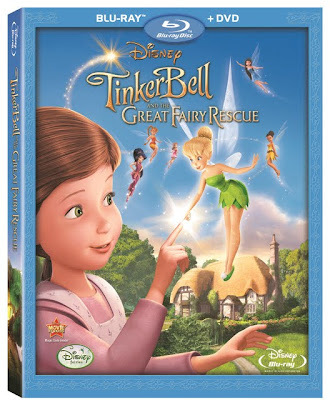 As touching as it is fast paced, Tinker Bell and the Great Fairy Rescue not only appeals to a variety of ages but may also interest boys in addition to the young girls for whom the movies are marketed, thereby encouraging greater gender-blind high-quality children’s entertainment.